Purpose: Address pressing ecosystem and economic issues in the Mississippi River watershed through a dialogue of residents and stakeholders representing the multiple interests of the communities and people on the River’s main stem and throughout its watershed. The Challenge: The Mississippi River - 2,300 miles long and serving nearly 18 million people in over 50 cities – is America’s great waterway, economically, ecologically and culturally. Yet it’s threatened by multi-agency management and geographically isolated policy. The Mississippi River suffers from place-based approaches that not only fail to address the whole watershed, they adversely affect whole sections of the River and the Gulf of Mexico. The result is the third largest water drainage system in the world – and its residents – suffer from national neglect. Strategy: Organize a National Dialogue on the Future of the Mississippi River using participatory technology: a computer on every table and a keypad in every hand. 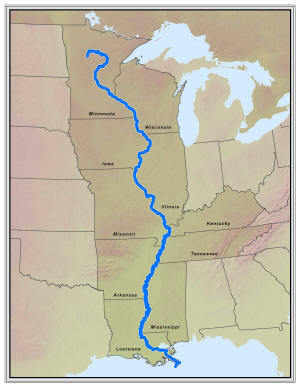 With internet connectivity, participants in multiple locations along the Mississippi River main stem – stakeholders from all the River’s sectors – simultaneously develop and vote on solutions and actions for the Mississippi River and get beyond location-specific approaches. Goals: Conduct a simultaneous dialogue on the future of the Mississippi River in up to 20 river communities. Participants across many states will develop priorities and action items for the whole River. Conference design uses a stakeholder representative steering committee including funders, NGO leaders, government, agriculture and business leaders. Professionally-facilitated meeting production to ensure optimum input from all participants and adherence to the Principles of Civic Engagement for trusted and authentic outcomes. River-wide awareness building to set the stage for expanded involvement, including intensive efforts to increase public awareness and support for River-wide approaches. Technical expertise to ensure successful teleconferencing operations on a national scale – This assistance is co-located at all the sites as well as in a central coordinating site. It plays a major role in ensuring that equipment is collecting, tabulating and transmitting at all times and in all locations. Immediate feedback to the assembled group plus final reports to community groups, participants, media and key stakeholders.